Marsel and I got her quilt loaded on the frame so that every spare moment could contribute to its completion! Marsel loves free motion and she made quick work of this! It's having its ta-da moment already! All the fussy-cut squares are rightly accented! Outside, the trees are responding to the near freezing night time temperatures. It is a brilliant display for us. The golf cart rides are a visual treat! It took a considerable amount of time and brain power! But I did it! I mixed up free motion with pantos and had a wonderful time quilting his blanket! Even the back looks cool! This was the turtle on the back, just before I added his eye! I got the binding done and then tossed it in the washer to give it the right look...... now to wrap a baby Elijah in it! On the knitting front, I stepped on the needle and snapped it! Bill did emergency surgery and repaired it for me! I didn't think it was smooth enough but it works just fine and I finished the second sleeve and started on the body! On to the hem! It was a long day! The quilt of Millie's vintage fabrics is off the frame and delivered to her! It was a blast to quilt! How can you not be happy with all those colors?! The chunky hat has had a remake and is all blocked. I like it much better now! Will add it to the stash! The weaving was completed last night and I put my line of clear school glue along both ends so first thing this morning I could cut it from the loom and hem it, press it and use it! The buffet is polished and reorganized! If you look closely, you can see how the yarn goes thick and thin which gives a very complicated wave to the weave. I think another one will happen with this yarn-I will experiment with a golden warp next time. It was nice to weave again. Here is a project that has been waiting for me for several years! This niche used to be a window until we built the addition. Bill left if recessed for me to places shelves and pretties. The glass come from the old jealousie windows in the train house where my parents stay each winter when Bill and Dad replaced them....I saved them to be used here and today it finally happened. The long delay was also due to frustration trying to find small brackets-the glass is only 4" wide and the recess is under 6". It seems you can't find them under 6" which means they would stick out. This is on my needles-it has to be my most favorite cardigan to knit! My Mom made it for me growing up, I made it for Marsel and then Abigail and now I will make it for another couple of grand daughters! The yoke grows by adding the lace chevrons which are popular again. I applied the grout today! Oh, yes, it is just such a wonderful window treatment! We head to the tile store to buy some more tile tomorrow! I have a job for a while to finish all the windows in the addition! Bring it on! On my bucket list is pottery. I have been looking for an affordable pottery wheel for a while. With a timely word from a friend, I am now the proud owner of one!!!! I also bought a few pieces he had for sale for inspiration! There is going to be a new art to delight my hands very soon! Bill and I took a tour this afternoon to see what the frost last night had done. Yes, it did its worst to our banana grove. Very sad. The Maple trees will begin to color now that we have had two nights near freezing. And so it goes. I started bright and early today, glad to be inside while the polar vortex brings us very cold temperatures in the forties! The piecing was very straight forward and I enjoyed just adding one to another all day. When it came to the applique plans......I hit a brick wall! Note to self-do not buy this double sided fusible web ever again! The paper just doesn't release and I had a mess. Then when I got the turtle done-it looked terrible on the neutral area! The shell just got lost and he looked lost in the space where he was supposed to pop! I cut out another one and didn't like that either........finally, the third one was the charm! Phew! I added the framing border and now I am ready to measure it for the backing when we go to JoAnn's this Thursday or Friday! It is nice to see it all come together! These guys were filling up on corn most of the day-it is cold for them, too, and corn is a good source of heat/feed! I worked on Millie's quilt until it was up off the floor-a big hurdle for me! Then I put my mind to the task at hand. I have to make a baby quilt for our new grandson, Elijah, due in January. The end of January. But there is going to be a baby shower the Saturday after Thanksgiving! That means I have to get it in gear to get the idea off paper and into my lap! I have the plans all drawn up. I have collected a pile of fabrics. Now I have to cut it all out! This is how I work from the drawing-figuring out how many of each and working to make it all fit before I begin sewing. I had planned on having the large squares in the center section on being cut 6 1/2" but I bought a collection and the fabrics were all cut as 6" strips. I just cut the sashing a bit larger and it should all work out just fine! I ended with a reknit-I ripped out the bulky cap that was just a bit too small and redid the math to make it larger. I have this feeling it is a bit too large but it will be whatever size it is after this! After company leaves, I like to go into either a cleaning mode or a creative one. Today, the eclectic creative one kicked in. A doll in the nursery at church needed some pants-easy way to wake the brain up. I sewed some pairs together and cut the others for this quilt. I painted the bowling balls that have been sitting in my sewing room for years. 'Now they are out of the room and outside where I intended them to be! 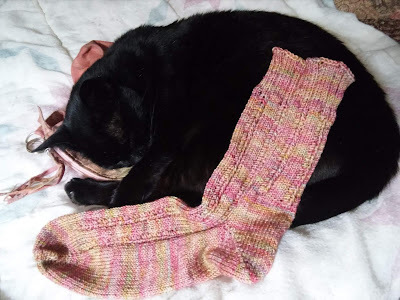 I warped my Ashford Knitter's loom and decided to use some Thanksgiving colored thick and thin yarn I got at a thrift store so I would have a runner on my buffet. It felt good to be weaving and this loom is a breeze to warp so no blood pressure issues! I finished the socks for Matthew! I can't believe the yarn matched up when I was just going for random....there is order in the universe! I sanded the glass pendants and set their bails so I can use them now! I worked on Marsel's shawl in the evening and finished chart two. And then I wondered why the lace border was so narrow........Yes, I forgot to do chart one of the edging first. The shawl is in the naughty bucket.